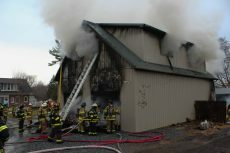 A fire started on the first floor of an exterior barn and quickly spread to the second floor of the barn that had been fashioned into a pseudo-apartment. Soon the fire engulfed the entire structure. The only reason it is still standing is because it is made of aluminum. Thankfully no one was hurt from the fire. Cityline was hired by the property owner to providing emergency services. This was done by initially weatherproofing the barn; by boarding up the openings we prevented further damage to the building. We then brought in our demolition crew to remove the debris from inside the barn and clean up the rubble. Due to the severity of the fire, most of the contents inside were burned or sustained massive smoke damage and were beyond recovery or repair. The homeowners worked with our office staff to create a list of the contents for the items that were lost during the fire so they could be compensated or replaced properly. Our years of experience came in handy with this tenant due to the quantity of collectibles that were lost in the fire. We worked with the homeowner to properly and accurately price out these items to their value. The homeowners were very happy with the work Cityline completed for them. - Fill out our form & someone will contact you shortly. Copyright © Cityline Construction. All rights reserved.